Keepers went into the exhibit today to clean and start to resume some of our normal routine. Lana and Nazca didn't seem to mind. 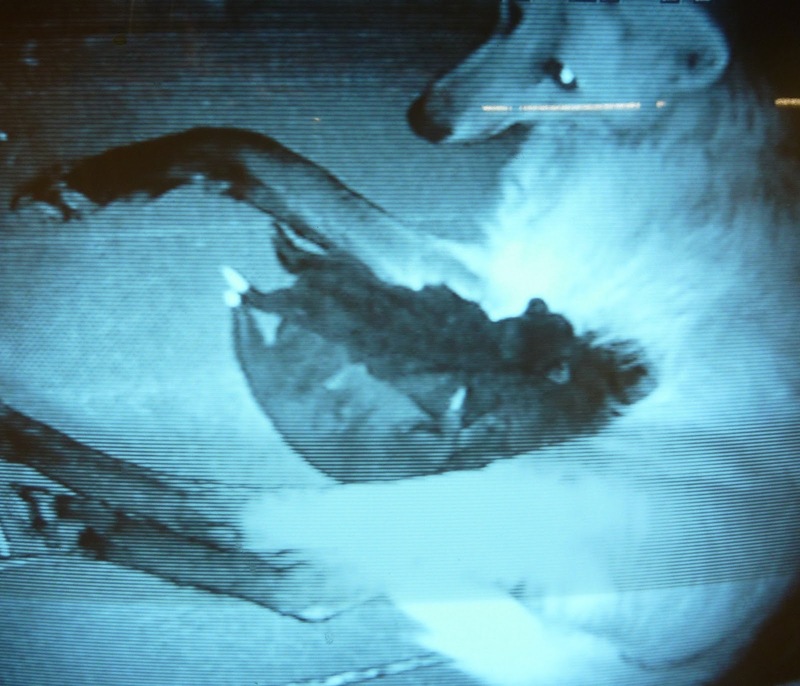 Because maned wolves seem to get stressed easily in captivity, White Oak Conservation Center decided to try a new approach to pup-rearing. Lana and her brothers were the first litter in which this new approach was tried. Parent-rearing is very important when possible, but White Oak wanted to also make sure that the pups were comfortable around their human caretakers to reduce over-all stress. To do this, White Oak would separate Lana's parents away from the pups for a short period every day and slowly spend a small amount of time socializing with the pups. Some parents will allow this separation and interaction without any problems, while others will not. We think that this new approach is one of the reasons that Lana is so calm and comfortable with us. We would like to copy White Oak's approach with this litter; we will be the only other institution to try it so far. If Lana and Nazca won't separate from the pups or if they seem too stressed or worried while they are away from the pups, we will stop the process. We are limiting this pup social time to keeper staff that the parents are already familiar with. This will not only reduce the possible stress on them, but will also limit the possibility of disease transmission by limiting the amount of foot traffic into the area. In the coming photos, it may look like the maned wolf pups are just like any puppy. This may be true in many ways right now, but don't be fooled by this socialization process. In a few weeks, we will no longer hold them or pet them. It will eventually be unsafe for us to do so and something that we wouldn't want to continue for adult wolves. When the pups are older, we will begin doing training sessions with them similar to how we train their parents. Yesterday, the parents' primary trainers started the process. We first separated the parents from the pups by luring them outside with treats. We then entered their inside holding area and gave the adults fresh food and water. We just wanted to start to introduce our scent into the area, so we walked around the den box a couple of times and then left the area without touching anything. We let mom and dad back inside and observed their reaction to our scent around the den. Neither parent seemed concerned and Lana soon settled in the den with her pups again. The pups' eyes should be fully open by today. However, they won't be able to see very well until they are about three weeks old.